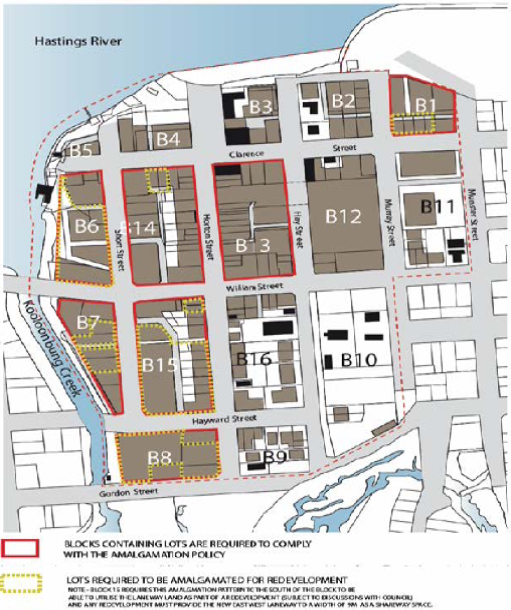 This report considers a development application for a commercial premises and tourist and visitor accommodation with clause 4.6 variation to clause 4.3 (Height of Buildings) and clause 4.4 (Floor Space Ratio) of the Port Macquarie-Hastings Local Environmental Plan 2011 at the subject site and provides an assessment of the application in accordance with the Environmental Planning and Assessment Act 1979. Following exhibition of the application, eight (8) submissions have been received. 1. Insufficient on-site car parking has been provided (deficit of 21 spaces) as required by the Port Macquarie-Hastings Development Control Plan 2013. In the context of this proposed tourist development located within an area with time limited parking the public interest would not be well served by allowing such a significant shortfall in parking spaces on site, or offsetting this number of spaces via the contribution plan. Against: Paul Drake and Dan Croft. The site has an area of 1518m2. · Construction of a seven (7) storey building comprising basement level parking. · The building will comprise ground floor commercial and tourist accommodation over levels 1 to 6. Levels 1 to 6 will contain 47 apartments comprising 4 x 3 bed units (with dual key arrangement), 28 x 2 bed units (with dual key arrangement), 12 x 2 bed units and 3 x 1 bed units. With the combination of dual key arrangements the proposal may provide for up to 79 leasable units. · 16 May 2018 – Application lodged. · 22 May 2018 – Application placed on hold following applicant advice that revised plans are to be lodged. · 25 June 2018 – Revised plans lodged. · 5 July to 3 August 2018 – Public exhibition via neighbour notification and advertising. · 3 July 2018 – Additional information request to applicant. Building height and off-street parking. · 6 August 2018 – Additional information request to applicant. Traffic impact assessment required. · 25 September 2018 – Additional information response from applicant addressing building height, parking and traffic requests. In accordance with clause 7, following an inspection of the site and a search of Council records, the subject land is not identified as being potentially contaminated and is suitable for the intended use. In accordance with clause 15C, given the nature of the proposed development, proposed stormwater controls and its’ location, the proposal will be unlikely to have any identifiable adverse impact on any existing aquaculture industries within the nearby Hastings River approximately 150m to the north-west from the site. There is no signage proposed as part of the application. Suitable condition has been recommended advising of consent requirements for future signage. In accordance with clause 4 the policy does not apply to serviced apartments. The site is located within the mapped coastal environment area. The bulk, scale and size of the proposed development is compatible with the surrounding coastal and built environment. The site is cleared and located within an area zoned for commercial purposes. BASIX affected building means any building that contains one or more dwellings, but does not include a hotel or motel. The proposal is not traffic generating development for the purpose of schedule 3 of this policy. No referral to Roads and Maritime Services was undertaken. The proposal is not identified as regionally or state significant development. The capital investment value is $14 million. The trigger for regionally significant development is $30 million. In accordance with clause 2.2 the subject site is zoned B3 Commercial Core. In accordance with clause 2.3(1) and the B3 zone landuse table, the proposed development for commercial premises and tourist and visitor accommodation are permissible landuses with consent. In accordance with clause 2.3(2) the consent authority must have regard to the objectives of a zone when determining a development application. · To provide a wide range of retail, business, office, entertainment, community and other suitable land uses that serve the needs of the local and wider community. · To encourage appropriate employment opportunities in accessible locations. · To maximise public transport patronage and encourage walking and cycling. · To ensure that new residential accommodation and tourist and visitor accommodation within the zone does not conflict with the primary function of the centre for retail and business use. · To provide for the retention and creation of view corridors and pedestrian links throughout the Greater Port Macquarie city centre. · The proposal is accessible and will provide employments opportunities. In accordance with clause 4.1 it is noted that no subdivision is proposed as part of the application. In accordance with clause 4.3, the maximum overall height of the proposal above ground level (existing) is 23.65m. The maximum building height standard applicable to the site is 19m. As a result, the applicant has submitted a Clause 4.6 variation to the standard. The variation represents a 24.5% departure from the standard. In gaining an appreciation of the extent of building height variation sought it is important to note the site has been excavated under a prior development consent. The ground level on site is now below that which previously existed. Specifically in the western central portion of the site ground levels are at least 700mm lower than historic natural ground levels. Also of due consideration is that in marrying in with Town Centre Master plan works along the Clarence Street frontage the finished ground level adjacent to the southern elevation of the building will be approximately 800mm above the existing ground level along this frontage. To this extent the roof of the proposed building comparative to the existing footpath level along Clarence Street level will vary between 17.8m in the south-eastern corner and 19.5m in the south-western corner. Whereas within the site, at the excavated ground level, the building height would be 20.55m in the south-eastern corner and up to 22.65m in the south-western corner. Along the northern elevation of the proposed building, at the excavated ground level, the building height varies from between 22.65m and 23.65m. The height plane plans provided as an attachment to this report illustrate the extent of the height variation proposed. The height plane plans also illustrate the height of the previously approved buildings on the site. Pursuant to Clause 4.6(3), consent must not be granted for a proposal that contravenes a development standard unless the consent authority has considered a written request from the applicant that justifies the variation by showing that the subject standard is unreasonable or unnecessary and that there are sufficient environmental planning grounds to justify the contravening of the standard. · The building design and height is consistent with the existing and future character of the locality in relation to height, bulk and scale. · Existing building designs in the locality provide for lift overruns, roof top access and communal use rooftop areas in addition to the main building envelopes. · There will be negligible impacts in relation to appearance, views, loss of privacy and loss of solar access. · The proposal will have minimal impact on the heritage values of the site. · The proposal will continue to provide for a transition in built form and land use intensity. · The proposal is consistent with the objectives of the LEP and is unlikely to have any implications on State related issues or the broader public interest. · When viewed from the street it will present as a six storey building. The 6th floor is adequately setback from the perimeter of the main building, add minimal bulk and will articulate the built form. As per Planning Circulars PS 18-003, Council can assume the Director-General’s concurrence for variations to height limits. The height variation is more than a 10% deviation from the standard and therefore the application needs to be determine by full council rather than under staff delegation. In accordance with clause 4.4, the floor space ratio of the proposal is 3.52:1. The maximum floor space ratio standard applicable to the site is 3.5:1. As a result, the applicant has submitted a Clause 4.6 variation to the standard. The variation represents a 0.57% variation from the standard. This equates to an additional floor area of 34.03m2 above the standard. · The extent of the floor space variation is minor. · The building design is consistent with the existing and future character of the locality in relation to building height, bulk and scale. · The proposal is consistent with the floor space ratio objectives. Having consideration to the above the applicant has demonstrated the proposal is consistent with the performance objectives of the floor space ratio clause. In addition, it is also considered that the proposal is unlikely to have any implications on State related issues or the broader public interest. As per Planning Circulars PS 18-003, Council can assume the Director-General’s Concurrence for variations to floor space ratios. The floor space ratio variation is less than a 10% deviation from the standard and could be determined by staff under delegation. However noting the building height variation proposed the application will be determined by full council in any event. In accordance with clause 5.9, no listed trees in Development Control Plan 2013 are proposed to be removed. “Should any historical relics be unexpectedly discovered in any areas of the site not subject to an excavation permit, then all excavation or disturbance to the area is to stop immediately and the Heritage Council of NSW is to be informed in accordance with Section 146 of the Heritage Act 1977”. In accordance with clause 7.3 the land is above the flood planning area and no flood related building controls apply to the site. In accordance with clause 7.4 the north-western portion of the site is partly mapped within the flood plain risk management area. The development provides for adequate emergency evacuation onto Clarence Street and no specific flood related measures are required. In accordance with 7.7, the proposed development does not penetrate the Obstacle Limitation Surface (OLS) of the Port Macquarie Airport. In particular the OLS for the site is approximately 60m. However, if a crane is to be utilised during construction, care will be required. A condition is recommended to ensure any crane used onsite does not penetrate the OLS and in the event that it does a controlled activity approval from the airport operator be obtained prior to works commencing. In accordance with clause 7.13, satisfactory arrangements are in place for provision of essential public utility infrastructure including stormwater, water and sewer infrastructure to service the development. Public exhibition undertaken in accordance with the requirements of this plan. Social Impact Assessment not considered necessary for the proposal. Adequate casual surveillance available and principles of crime prevention through environmental design achieved. · Site is mapped as potential archaeological site. Refer to comments earlier within report. · No tree removal proposed. · Stormwater management details to be provided. Stormwater capable of being managed. Details to be provided with section 68 application. - Motel accommodation requires 1.1 per unit + 1 per 2 employees (onsite at any one time) + 1 for on-site manager. - Commercial premises requires 1 per 30m2 of Gross Leasable Floor Area (GLFA). - Function room requires 1 per 30m2 serviced floor area in commercial zones. Total for motel = 89.9 spaces. - 195.3m2 = 6.51 spaces. Total required parking for dual key arrangement = 99.084 spaces. Total parking proposed = 61 spaces. The proposal seeks a variation to clause 2.5.3 which requires onsite parking to be provided in accordance with Table 2.5.1. In accordance with the table above 99.084 (100) spaces are required to serve the development with 100% occupancy of all units inclusive of 32 dual key units. The proposal includes 61 spaces. Thus resulting in a parking shortfall of 38.084 spaces. The DCP provides that Council may consider a reduced level of parking where it is supported by a parking demand study that assesses the peak parking demands for the overall development and completed by a suitably qualified and experienced person. - Adequate provision is made for off-street parking commensurate with volume and turnover of traffic likely to be generated by the development. - To ensure no adverse impacts on traffic and road function. The application was supported by a traffic impact assessment that included a parking demand analysis. The assessment was prepared by TTM Consulting dated 9 August 2018. The assessment included a dual occupancy (i.e. dual key) parking sensitivity assessment. The assessment assumed an 80% occupancy rate and that 20% of guests would arrive via taxi, ride sharing or public transport. Based on these assumptions it was estimated that the parking demand for 79 units alone would be approximately 50-51 spaces. With the addition of the ground floor commercial parking demand of 6.51 spaces, employee parking demand of 3 spaces and function centre parking demand of 2.674 spaces the total peak parking demand equates to between 62.184 - 63.184 spaces. Under this scenario a parking shortfall of 2.184 spaces would apply. It is considered reasonable to assume a reduced occupancy rate for motel style accommodation. Data obtained from the Destination NSW website (source being Australian Bureau of Statistics (ABS), survey of Tourist Accommodation) suggests for the years ending 2014 and 2015 occupancy rates were 62% and 68% respectively for tourist style accommodation in Port Macquarie for establishments with 15 or more rooms. The adopted 80% occupancy rate is considered appropriate and probably on the conservative side having regard to these statistics. However assuming 20% of guests will not arrive via private vehicle is not substantiated within the parking study. No data, survey work or research has been provided that validates this assumption. In the absence of such evidence it is considered inappropriate to adopt this assumption. The traffic study also acknowledges that during periods of high occupancy (peak holiday periods) that the car parking demand may be higher and recommend that a parking booking system be implemented to manage the available parking. However, this is considered inappropriate as there will likely be an increased reliance on on-street parking during these times. It is argued that the adopted parking demand rate within the DCP for motel style accommodation already accounts for a portion of guests arriving by alternate means. It could also be argued that the assumption of an 80% occupancy ratio also further accounts for a portion of persons arriving by alternate means. · 79 lettable units at 80% occupancy equates to 63.2 units (i.e. 79 x 0.8 = 63.2). 63.2 units x 1.1 spaces per unit = 69.52 spaces. · Employees: 6 at 1 per 2 employees (6/2) = 3 spaces. · Commercial premises: 195.3m2 (1 per 30m2) = 6.51 spaces. · Function Room: 80.22m2 (1 per 30m2) = 2.674 spaces. · Total parking demand required = 81.704 spaces. Parking proposed is 61 spaces. Therefore a parking shortfall of 20.704 spaces is a result (i.e. 81.704 spaces required – 61 space proposed). Having regard to the overall findings of the traffic impact assessment prepared by a suitably qualified professional Council staff are comfortable that proposal will not result in any significant adverse impacts to traffic, parking or road function. 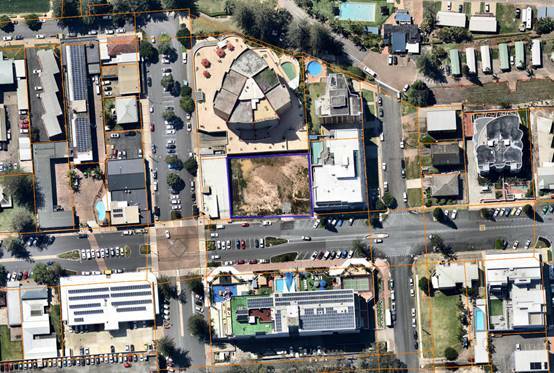 Nevertheless the site is located within the Port Macquarie-Hastings Contributions Plan 1993 – Part C – Car Parking and it is considered appropriate that a development contribution be made under this plan for the identified parking shortfall of 20.704 spaces. A condition has been recommended surrounding the payment of the parking shortfall contribution. The future heritage and leisure focus of the town for visitors and residents, Clarence Street will be a distinctive tree lined pedestrian dominated area with hotels and holiday apartments above an active street frontage lined with restaurants, heritage buildings and sidewalk cafés. The new buildings should respond to the heritage buildings without mimicking them. 7 storey apartment style building with ground floor commercial. Ground floor commercial will provide active street frontage. Building design considered to be not out of character with existing flat buildings within the precinct. - Amalgamations are desired on land identified in Figure 26. - If applicants propose a different amalgamation pattern then they must demonstrate that orderly development, high levels of connectivity and vehicle access will occur and that mid-block connections are provided appropriately. Proposal inconsistent with desired amalgamation plan. Refer to figure below table. Three lots (minus the corner lot) have been amalgamated. Considered to be a good outcome. - Maximum shop widths comply with Figure 27: Maximum shop widths. The ground floor shop front width is less than 30m. Façade enclosure complies with the block controls. Break up roofs where possible with hips, gables and changes in materials. Roof broken up with lift overrun and root top terrace structures. Maximum Building Depth. Ground whole site less setbacks, First/Second/Third/Top = 20m. Building depth of approximately 22m considered appropriate. Front Setback (Clarence Street). Ground/First/Second/Third = 0m. Top Floor = 3m. Front lobby on front boundary 0m consistent.<1m first/second/third/fourth/fifth with elements within articulation zone. Noting top floor setback 3m. Rear Setback. Minimum 0m to Block 1 Lane for Ground/First/Second/Third. Top Floor minimum 3m. Proposed 8.7m to rear boundary. Further setback on top floor. 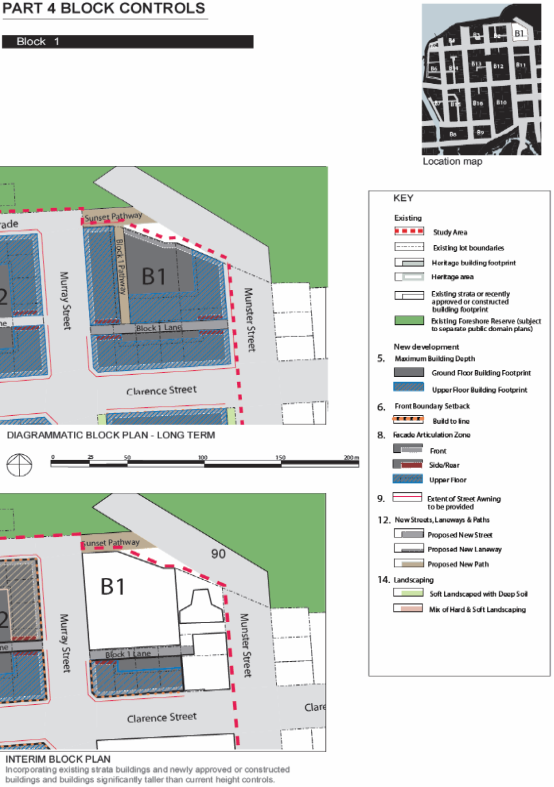 Note future laneway not possible having regard to Macquarie Waters building. Side Setback. Minimum 0m to Block 1 Pathway for Ground/First/Second/Third. Top Floor minimum 3m. Proposed 0m side boundary setback from ground to 5th level. The top floor setbacks range between 0m, (approximately 7.6m length of eastern aspect of building – stair shaft and portion of Unit 604), up to 13.695m (north-western aspect of building). · reasonably short wall lengths of the proposed building compared to the overall length of the site. · the relationship of the non-compliant length of external wall of the proposed building with the existing western external wall of the adjoining building to east. · the relationship of the proposed building to the bulk and scale of development to the east. · the significant open area of the proposed development. · the overall merits of the proposed development and the practical difficulties associated with compliance and achieving a viable project. · the lack of detrimental overshadowing of the adjoining properties due to the existing lots orientation to north and south. · the size and scale of existing adjoining development to the east, west and north. · the flow through ventilation for the proposed units which do not need to rely on side windows to provide ventilation. · the use of varying finishes on the side elevations to create additional interest and relief and to decrease the vertical emphasis on the building as a whole. · the non-compliance will result in no loss of primary views for residents of other buildings. Façade Enclosure. Ground 60%, First 50%, Second/Third 40%, Top Floor 40%. Articulation provided to the street considered appropriate. Wall finish treatment is proposed to the western elevation which will provide an appropriate interim measure until the corner block is developed. Access directly from Clarence Street. New Streets, Laneways and Paths. Block 1 Lane. Min 7m wide – two way vehicle movement and 1m footpath. Proposed level basement car parking. No provision for laneway. Full width footpath across frontage required. Car Parking Underground, on street, some on grade. Proposed basement car parking and commercial spaces at grade. Residential Flat Development, Tourist and Visitor Accommodation, Mixed Use Development Provisions. - Attributes and constraints adequately considered in design. - Consideration to adjacent and adjoining sites in design. - Functional & integrated with neighbourhood. Detailed site plan provided with application demonstrating integration with potential integration with adjoining sites. - Min floor to ceiling 2.7m. - FSR at least 1:1. No. Refer to LEP clause 4.6 comments. - Front setback with 20% of average setback of adjoining buildings. - Tourist accommodation 9m max setback for pool. - Balconies may encroach up to 600mm into setbacks. - Building aligned to street boundary. - Openings align with street or rear of site. Swimming pool proposed on roof top. - Side setback min 1.5 for max 75% of building depth. - Windows in side walls setback 3m from side. - Adjoins existing strata building side set back min 3m. - Rear setback min 6m to building & sub basement. - Party wall development if site amalgamation not possible and higher density envisaged. - Corner sites consolidated with adjacent sites. No windows in side walls. Adjoins strata title flat building to the east. 8.7m rear setback to building. Site amalgamation as per DCP not achievable. Noted but considered best achievable outcome. Building depth of approximately 22m. Building depth considered acceptable. The depth is reflective of existing similar sized buildings adjoining. - Adequate light and ventilation. North facing balconies. No adverse shadow impacts given lot orientation. Yes. Ventilation and solar access considered appropriate having regard to the short term use proposed. Landscaping proposed along Clarence Street frontage. - Deep soil zones should extend width of the site and be minimum depth of 6m. - Deep soil zone should accommodate advanced plantings. No deep soil zone proposed. The site is zoned B3 Commercial and consistent with the area based provisions above no deep soil zone requirement has been envisaged for this site. - Ground floor dwelling min 35m2 with 4mx4m area. - Areas <2m in width be excluded from area. - Balconies on or above first floor min 8m2 with min 2m width with direct living area access. No ground floor units proposed. The rooftop terrace area inclusive of BBQ, gym, pool and toilets facilities provides sufficient communal open space. Yes. Each unit also contains access to external balconies of sufficient width and depth. - Openings of adjacent dwellings >3m separation. - Building wall design minimise noise transition comply with AS. Noted that some bedrooms at front of building face street. N/A no ground floor units. Designed to comply with noise transmission requirements. Noise impacts considered to be minimal having regard to the short term nature of use. Additional glazing to bedroom windows possible. - Direct views between adjacent living areas screened if with distances. - Screening or fence requirements. Privacy walls and screening proposed where necessary. Capable of compliance with AS1428. Details to be provided with Construction Certificate. Ground flood at grade access with lift proposed. - Located close to open space/recreation areas. - Variety of apartment types, 1, 2, 3+ beds. Close to Town Green open space and foreshore areas. 1, 2 and 3 bedroom units. Roof top structures provided varied roof form. Overrun and plant incorporated into roof top structures. Consistent with existing flat buildings within the locality. Building entry well defined, sheltered and adequate circulation space. - Min one balcony per apartment. - Main balcony min 2m width a 8m2. - Directly accessible from living area. Recessed and balustrade details provided. Capable of access from street hydrant. Design meets principles of crime prevention through environmental design. - Communal bulk waste facilities to be provided. Garbage storage on ground floor behind commercial tenancies. 19m LEP max height limit applies. · A zero metre setback to ground floor is preferred in all business zone developments. · Variations in roof form including the use of skillions, gables and hips are to be provided in the development. Variation with roof terrace proposed. Lift overrun and plant incorporated. · Colours, construction materials and finishes shall be predominately pale in colour and textured, tonal and subtle. Proposed colours appear acceptable and consistent with existing flat buildings within the street. · Shopfront widths are to be between 15 and 20metres. · Architectural detailing is to be provided to promote articulation, character and visual interest in the streetscape. Architectural detailing provided within the articulation zone. Incorporates overhangs and recesses. · Ground floor levels shall not be used for residential purposes in B1, B2, B3 and B4 zones. · A minimum of 50% of the ground floor level front facade is to be clear glazed. Approx 50% of street frontage clear glazed. Awning structure provides coverage for the extent of the active street frontage. · Skylights may be provided in the awning for a maximum depth of 1/3 of the total awning depth. · Under awning lighting shall comply with AS/NZS1158. · Awnings are designed and constructed to encourage pavement dining in areas identified for pavement dining, along the foreshore and in piazzas. Awnings designed to encourage outdoor dining opportunities. · No direct vehicular access to at grade or basement car parking from the active street frontage will be permitted in B1 zones. · The number of vehicular crossovers shall be kept to a minimum and appropriate sight lines provided to ensure safe integration of pedestrian and vehicular movement. B3 Zone. Single crossover proposed. Access to basement car park from main entrance off Clarence Street. Single crossover proposed at grade. · The development complies with AS1428—Design for Access and Mobility. Designed to comply with standard. · The development is designed so that all vehicle movement areas and servicing areas are located away from adjoining residential areas. Site adjoins residential units located to the east. Site does not adjoin residential zoned land. · Waste areas are located and managed to minimise pests, noise and odour. Garbage storage located on ground floor behind commercial tenancy and basement for residential units. No planning agreement has been offered or entered into. The proposed development is consistent with the objectives and strategic actions of this policy. See SEPP (Coastal Management) 2018 comments for further detail. No coastal zone management plan applies to the site. The site was historically three single Torrens title lots with each containing old unit buildings. The old units have been demolished and the lots consolidated under a previous development consent. Site has also been subject to excavation under a previous development consent and slopes away from south to north approximately 2m. The site has a frontage of 45.25m to Clarence Street and an average depth of 33.53m. Adjoining the site to the north is the North point Apartments (9 storey residential flat building). Adjoining the site to the east is the Macquarie Waters apartments (six storey residential flat building). Adjoining the site to the south is Clarence Street and beyond is the Port Pacific Resort building. Adjoining the site to the west is a single storey commercial building fronting Murray Street. The proposal is considered appropriate in terms of density and height and will be unlikely to have any adverse impacts to existing adjoining properties and satisfactorily addresses the public domain. The proposal is considered to be consistent with other higher density developments in the locality. The proposal will not compromise any important views or view corridors. Impact to views enjoyed from units of the Port Pacific building would be minimal given the change in grade on Clarence Street and the subject site, and the location of existing buildings adjacent to the site. It is evident that the orientation of the block, units and subsequent balconies seek to maximise light and ventilation with the northern orientation. The building has been positioned in the southern portion of the block. This provides for adequate separation to the units in the North point apartment building. It is considered that sufficient spatial separation between the units will be provide for an acceptable level of privacy. The site has road frontage to Clarence Street. Adjacent to the site, Clarence Street is a sealed public road under the care and control of Council. Clarence Street is local commercial road with a 22 metre carriageway within a 30 metre road reserve. The existing road includes SA kerb and gutter, footpath paving, and combination of parallel parking and angled parking. The access is proposed to be via a 6.0m wide Category 2 access crossover. The development access will provide an effective queue provision of 4 vehicles between the property boundary and the security access door. The car parking provision generally exceeds Council’s Development Control Plan’s minimum parking requirements. The ground level and basement car park layouts, as a minimum, comply with the Australian Standard requirements. Overall, TTM considers the proposed car parking arrangements for this development are adequate. Assessment of the proposed development indicates that the development will not have a significant impact on the future road network. As such, no further mitigating road works are required. Servicing for this development will be facilitated in the designated loading area on the ground level, accessed from Clarence Street. The largest design vehicle, a VAN, can enter, manoeuvre, service and exit the site in a forward gear. Overall, the proposed service vehicle arrangements are considered adequate to meet the needs of the proposed development. The current public transport infrastructure and proposed site provisions for pedestrian/bicycle facilities is considered adequate for the development. Based on the assessment contained within this report, TTM see no traffic engineering reason why the relevant approvals should not be granted. Key issues or recommendations to be addressed by conditions. To protect existing road facilities, existing road conditions shall be evaluated and bond securities held prior to any earthworks Details shall be provided as part of a Roads Act (Section 138) application. Vehicle access to the site is proposed though one access driveway to Clarence Street. All accesses shall comply with Council AUSPEC and Australian Standards, and conditions have been imposed to reflect these requirements. · Reconstruction of kerb and gutter to the east of improvement works (new kern and pavement) to marry in with works already carried out by Council as part of the Town Centre Master Plan. · A condition is recommended requiring that prior to the preparation of any engineering plans or submission of any applications for construction to Council, the applicant is to contact Councils Engineering Development to ensure any design accords with Town Centre Master Plan works already carried out on Clarence Street across subject property. The applicant is advised that works include altering verge, carriageway and kerb levels to improve surface drainage conditions for the full frontage of the development. Parking and driveway widths on site can comply with relevant Australian Standards (AS 2890) and conditions have been imposed to reflect these requirements. Due to the type of development, car park circulation is required to enable vehicles to enter and exit the site in a forward manner. Site plans show adequate area is available and conditions have been imposed to reflect these requirements. In accordance with the Port Macquarie Town Centre Master Plan, the proposed development will require full width concrete paving along the frontage of the site with specified materials and finishes. Suitable conditions recommended. No adverse impacts on public spaces or access thereto. The proposed preliminary stormwater design prepared by David Johnson Consulting Engineer, dated May 2014 is acceptable in principle. The site naturally grades towards the rear and is benefitted by an easement 1 metre wide to drain water over SP65485, the development proposes to extinguish the easement and instead drain to the Council’s pipe network in Clarence Street. 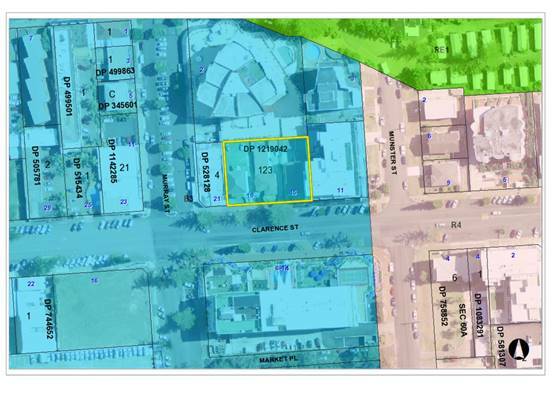 The legal point of discharge for the proposed development is defined as a direct connection to Council’s stormwater pit/pipeline in Clarence Street, which is consistent with the development proposal. A detailed site stormwater management plan will be required to be submitted for assessment with the S.68 application and prior to the issue of a building Construction Certificate. In accordance with Councils AUSPEC requirements, onsite detention facilities must be incorporated into the stormwater drainage plan. Preliminary plans incorporate onsite detention facilities. · Hay bale retardation and sediment retention basin. The removal of stormwater from the excavated area will be via a temporary hay bale structure which will be provided on site. The size of the structure to be determined via the volume of water to be treated. In this regard the operation of the structure is to be inspected on a daily basis and the quality of discharge water monitored. · Where necessary the size of the structure will be increased so as to ensure that acceptable discharge standards are met. · All stormwater is to be collected and conveyed to the structure using suitable sized pumps. The foot valve of the pump is to be fitted with a silt sock. The hay bale structure will act as a two-stage sedimentation basin. Pumped water will be discharged into the larger section of the structure where it will be allowed to settle and seep through the straw bales into the final section where it will be allowed to settle before draining through the overflow to discharge into the stormwater drain servicing the site. · The pond shall be regularly inspected, and excess sediment removed on a daily or more frequent basis as required. · Sediment filter fencing, or gravel groynes/sausages will be used downstream of the discharge from the hay bale structure to provide additional treatment. · Gravel groynes/sausages for sediment retention will be utilized around stormwater drains, inlets and pits once constructed. · Tracking of sediment from the site by tucks entering and leaving will be controlled by the provision of a ‘shaker grid’ at the site entry together with the placing of a gravel driveway at the entry site. · Discharges from dewatering operations shall be treated to remove excess suspended matter prior to discharge from the site. Discharges shall be free of pollutants, shall be within a pH range of 6.5-8.5 and shall have a maximum non-filterable residue (NFR) concentration of 50 mg/L to allow for discharge to the stormwater system within Environment Protection Authority requirements. Removal of suspended matter from dewatering discharges shall be achieved by treatment of discharges through the hay bale filtration/sedimentation pond detailed in 6.1 above. Detailed plans for the management of stormwater will be required to be submitted for assessment with the infrastructure construction certificate and S.68 applications. Records indicate that the current development site has an existing 20mm metered water service from the 150mm PVC water main on the same side of Clarence Street. Each residential and commercial unit will require individual water metering with the meters either located on the road frontage or at the unit with remote reading facility located adjacent to the road frontage or in an easily accessible area such as a foyer. Final water service sizing will need to be assessed by a hydraulic consultant to suit the commercial, domestic and fire service components of the proposed development, as well as backflow protection requirements. The existing 20mm metered water service is to be disconnected. There is no charge for this disconnection service. Detailed plans will be required to be submitted for assessment with the infrastructure construction certificate and S.68 applications. Council records indicate that the development site is connected to sewer via junction to the existing sewer line that runs along the northern property boundary. A sewer reticulation strategy is to be provided. A manhole will be required at the high end of the line as it will be more than 40m long. If the main is subject to future extension an end of line terminal shaft (poo pit) will be required. As the development will exceed 2ET discharge, sewer connection is to be made from a manhole. The hydraulic designer is to confer with Council sewer section prior to submitting sewer design plans. Detailed plans will be required to be submitted for assessment with the infrastructure construction certificate application and S.68 applications. The operations of the proposed development will be unlikely to result in any adverse impacts on the existing air quality or result in any pollution. Construction of the proposed development will not require any removal/clearing of any significant vegetation and therefore will be unlikely to have any significant adverse impacts on biodiversity or threatened species of flora and fauna. The proposal is not BASIX affected building. The proposal will include measures to address energy efficiency in order to comply with the requirements of section J of the Building Code of Australia (BCA). No adverse impacts anticipated. Having regard to the location of the site and nature of the development, there will be anticipated short term noise impacts during construction activities. Consent condition has been recommended to restrict construction to standard construction hours and a condition requiring a construction management plan which includes a schedule of works and approximate timing, contact number of site supervisor and mechanism for providing notice to adjoining owners for schedule noisy works. In terms of vibration impacts and proximity of adjoining sites which are built to boundary a condition has been recommended to require dilapidation reports prior to work and upon completion of works to adjoining properties. In terms of the visitor accommodation use, it is noted that no onsite manager is proposed. A condition of consent has been recommended to require a complaints register to be established by management and this be made available upon request to Council. The condition also requires that a telephone number be provided on the front of the building for any complaints. Having regard to the short term nature of stays proposed and use of the communal roof top terrace facilities which includes a BBQ area, swimming pool and outdoor terrace the potential exists for noise during high activity times. It is noted that these roof top areas have been located in the north western part of the top floor which will provide adequate separation between adjoining flat buildings to the north and east of the site. It still considered that some type of management regarding the use of this rooftop area is required. A condition has been recommended requiring a rooftop management plan be development and approved by Council prior to issue of any occupation certificate. A further condition has been applied requiring the approved plan to be displayed in a prominent position on the rooftop area so guests are duly informed. The site is not mapped as bushfire prone land. Refer to comments under clause 7.4 of LEP comments for flood considerations. The proposed development will be unlikely to create any concealment/entrapment areas or crime spots that would result in a loss of safety or security in the area. The increase in housing density will improve natural surveillance within the locality and openings from each dwelling overlook common and private areas. No adverse impacts. Likely positive impacts can be attributed to the construction of the development. Having regard to the location of the site and nature of the development, there will be anticipated short term inconveniences during construction activities. No significant adverse construction impacts are identified to neighbouring properties that would warrant refusal of this application. The proposal will fit into the locality and the site attributes are conducive to the proposed development. Site constraints have been adequately addressed and appropriate conditions of consent recommended. Eight (8) written submissions have been received following public exhibition of the application. The proposal provides no detail on overshadowing impacts. Private open space on the adjoining Macquarie Waters building is orientated north-west. Shadow diagrams should be provided to determine the extent of shadow impacts. Having regard to the sites north south orientation it is evident that the adjoining properties will not be adversely overshadowed by the development for more than 3 hours between 9am -3pm on 21 June. Based on the information lodged it is difficult to ascertain whether the building height proposed is being taken off pre-excavated site levels or existing level as excavated. The applicant provided revised plans and clause 4.6 variation confirming building height proposed form existing ground level as excavated onsite. The proposal bases its car parking demand on 47 units and 6 staff. The proposal however contains 79 separately lettable units. The DCP currently provides no mechanism for reduced parking for a dual key system. A shortfall of 36 parking spaces is not appropriate for the locality having regard to existing parking demand experienced. Refer to DCP assessment table within this report. The proposal does not propose a 6m wide deep soil zone as per DCP 2013, specifically provisions 3.3.2.6, 3.3.2.11 and 3.3.2.16. Provision 3.3.2.6 refers to side and rear setbacks. The rear setback complies. Provision 3.3.2.11 refers to deep soil zone width and depth. The lack of deep soil is consistent with the area based provisions and commercial zoning of this site. Provision 3.3.2.16 refers to landscaping requirements. Having regard to the commercial zoning the minimal landscaping proposed along the street frontage is considered acceptable. The current condition of the site is not acceptable. Currently stormwater collects and pools in the north-western corner and leaches into the basement of the north point building. It is requested that Council instruct the landowner to fix this stormwater problem immediately. Noted Council staff are aware of the existing stormwater issue and will continue to monitor and managed accordingly. Stormwater for the proposed development can be adequately managed. The building is excessive in size and height. There is no good reason for the height variation. Refer to building height comments under LEP 2011 of the report. The proposed building is considered to be consistent with other buildings in the locality. The majority of the built form is contained within the height controls. The elements on the roof add further articulation to this form and are consistent with similar roof top elements on flat buildings in the locality. There is insufficient parking proposed to accommodate the proposed development. Refer to parking assessment comments under the table to DCP 2013 of the report. The northern setback is insufficient to the north point building. Refer to DCP 2013 assessment table within this report. Rear setback complies. No details of expected building construction start and finish times. Potential noise impact to adjoining residents. Temporary noise blocking panels should be installed to existing adjoining units. Standard building construction times will apply as per recommended consent conditions. No significant adverse building construction noise impacts are anticipated that would warrant refusal of this application. No details of cranes has been provided. Safety hazard to existing adjoining units and traffic blocks likely. During construction items may fall onto my residence at 2 Murray Street. The placement and management of cranes and any machinery during construction will be undertaken by site managers and subject to workplace safety measures. Service disruptions would occur during construction. How will I be informed? Is there sufficient services to meet the demand of the proposed development? Anticipated service disruptions during construction will be managed by the relevant service provider. Upgrading of services will be required as deemed appropriate by the relevant service provider. Ongoing noise impacts from occupants utilising the open style communal roof top space with swimming pool. A rooftop management has been provided for this space and will form part of the consent conditions. No significant adverse noise impacts are anticipated that would warrant refusal of this application. Ongoing noise impacts from air-conditioning plant. Standard noise control regulations apply to management of noise from such sources. No significant adverse noise impacts are anticipated that would warrant refusal of this application. Open car parking is proposed at ground level with driveways at same level as North Point level 2 apartments. This will result in adverse noise and security impact. Adequate building separation is proposed between the ground level parking and North Point building. The north point building is setback approximately 13m form the site boundary. No significant adverse noise impacts are anticipated that would warrant refusal of this application. The proposed units will be only 20m from my bedroom and living space in North Point apartments. This will result in a significant loss of privacy. The orientation of the block, building and subsequent balconies seek to maximise light and ventilation with the northern orientation. The building has been positioned in the southern portion of the block with the rear balconies setback approximately 8.7m from the rear boundary. This provides for approximately 20m separation to the units in the north point building. It is considered that sufficient spatial separation exists between the units. The northern side of the building contains a large amount of glazing which will direct light and heat into the units of north point. Adequate building separation is proposed. No adverse reflection or heat impact will result from the glazing proposed. There is no discussion about potential liquid trade wastes that may be generated from the ground floor shop. The proposal is for a ground floor commercial tenancy only. The use proposed is unknown and likely require further development consent under which waste management will be considered. No details of solar panels or rainwater use provided. Council should require this as part of all new developments. The proposal is not a BASIX affected building therefore such measures are optional. Having regard to previous failures will Council require the building to start within a certain timeframe? Planning legislation provides that should development consent be granted a proponent has 5 years to physically commence work. Once commenced there is no legal obligation to complete the development within a set time frame. The units in north point will be greatly devalued if approved. Impact upon property values is not a relevant planning consideration. How will dust and debris be managed during construction noting location of clothes drying facilities adjoining in the north point building? Standard site management conditions will apply including dust control. The owner is extremely difficult to deal with and has ignored previous consent conditions and instruction by Council for stormwater management. · Development contributions will be required under Section 94 of the Environmental Planning and Assessment Act 1979 towards roads, car parking, open space, community cultural services, emergency services and administration buildings. 6View. DA2018 - 353.1 Traffic Impact Assessment Report.